1. Read through instructions before starting. from the starting chain in multiples of 4. Note: If it is longer than 54 inches you will run out of yarn. 3. To make wider work more rounds. 4. Fasten off, turn over and change colors every round. have a right and wrong side. Center Row:~ 80 ft. Yarn A. Round 1:~ 125 ft. Yarn B. Round 2:~ 135 ft. Yarn A. Round 3:~ 140 ft. Yarn B. PATTERN: Use one strand of yarn at a time. Center Row: Chain 220. Dc in 4th ch from hook, dc in next 2 ch *ch 1, skip 1 ch, dc in next 3 ch, repeat from * across, ending skip 1 ch, dc in last ch. There should be 54, 3 dc groups and a loop on each end. 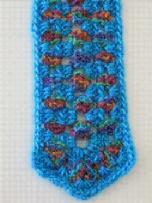 Fasten off, turn over and attach new color in one of the end loops. Round 1: Ch 3, 2 dc in loop of foundation row. Work (ch 1, 3 dc) 3 times in same loop. (There will be 4 groups of 3 dc.) Work 3 dc in spaces between dc groups, to loop at opposite end of foundation row. Work 3 dc, (ch 1, 3 dc) 3 times in end loop. Continue around working 3 dc in each space between the dc groups. Slipstitch in top of ch 3. Fasten off, turn over and attach new color in the first ch 1 space on opposite end. Round 2: Work Starting Corner. Work Corner in next 2 ch 1 spaces. 3 dc in each space between dc groups along side. Work Corner in next 3 ch 1 spaces. 3 dc in each space between dc groups along side. Slipstitch in beginning ch 3. Fasten off, turn over and attach new color in the first corner of opposite end. (6 corners). Round 3: Work Starting Corner. 3 dc between next 2 groups of 3 dc. Work Corner in next ch 1 space. 3 dc between next 2 groups of 3 dc. Work Corner in next ch 1 space. 3 dc in each space between dc groups along side. Work Corner in next ch 1 space. 3 dc between the next 2 groups of 3 dc. Work Corner in next ch 1 space. 3 dc between next 2 groups of 3 dc. Work Corner in next ch 1 space. 3 dc in each space between dc groups along side. Slipstitch in beginning ch 3.